At ProMeet we are big supporters of the International Association of Facilitators (IAF). IAF is a global association of over 1500 competency certified professional facilitators. It aims to promote the power of facilitation and drive up professional standards. It's a wonderful community and we have learnt a huge amount though becoming certified, attending conferences, and participating in MeetUps. A new development. IAF has been developing a 'Pro-Path', essentially adding two new tiers of membership, a 'mentored' level for people new to the profession and a 'senior or master' level for facilitators who already have attained "Certified™ Professional Facilitator or CPF" status. It will all roll out next year, but to get the headlines of this 'pro-path' you can watch this short video. Over at our other blog on Serious.Global we have published a new post on listening. 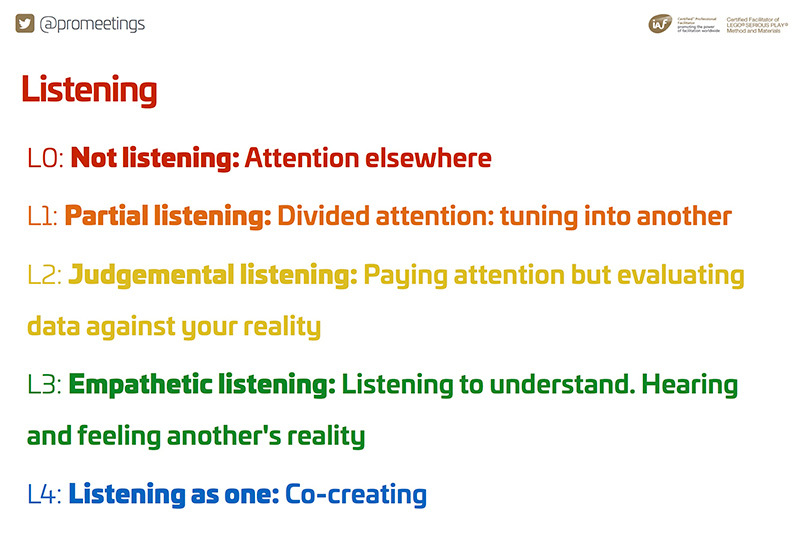 First we introduce an idea that there are five levels of listening we use day-to-day and especially in meetings. Next we explain how LEGO® SERIOUS PLAY® uses three modes of communication that results in higher levels of listening. Finally, for facilitators familiar with LEGO® SERIOUS PLAY®, we share how to help people listen and understand even more fully. There are many audience interaction tools and technologies out there, but the one I think is the best (after having used a few) is Slido. Let me share my 10 reasons why you should check out Slido next time you want to engage your audience. 1. Slido helps create participatory meetings. 2. 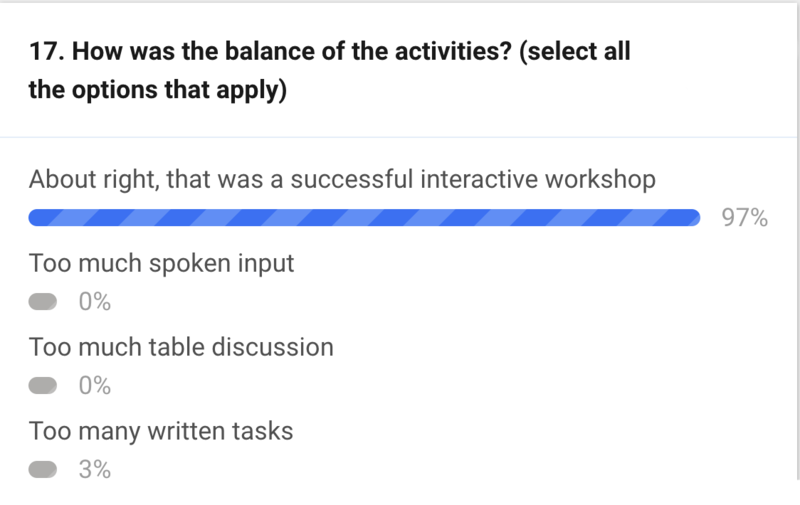 Participants report they enjoy using Slido. EVERY time I use Slido at least one participant comes to tell me afterwards how much they enjoyed interacting. 3. Slido Polls are a great way to quickly understand the headline opinions in the room. 4. Slido gathers useful data. 5. 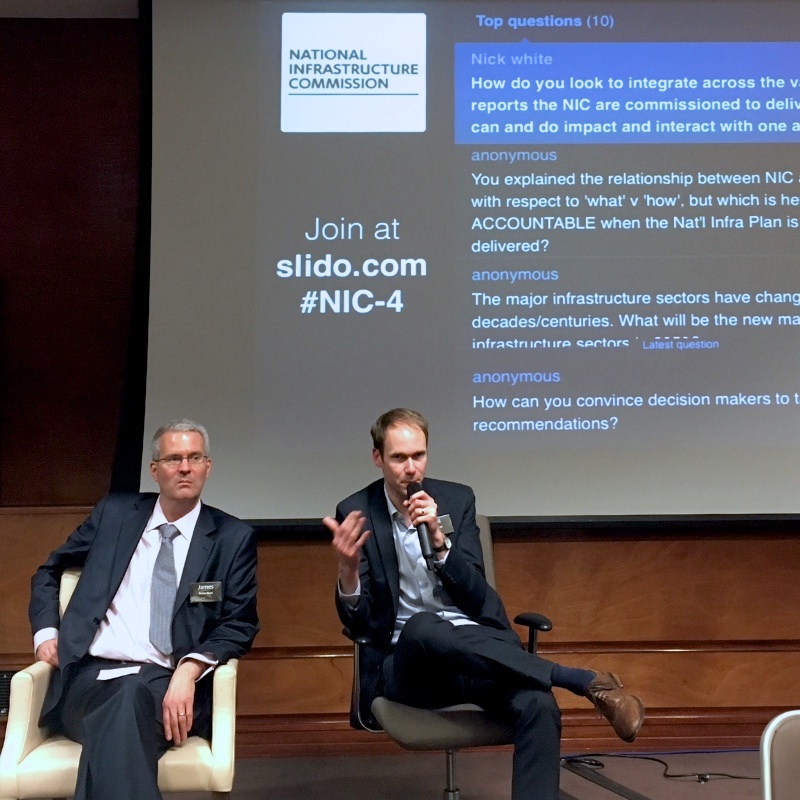 Slido questions allow participants to ask questions when they arise (not just in the Q&A) and allow participants to ask difficult questions anonymously. 6. As a facilitator - Slido is easy to set up before an event and use live during an event. No support needed. 7. As a participant the interface and UX is simple and easy to use. 8. As a nerd, Slido is uses a light weight browser, (not an app), pulls little data which means wi-fi/3G/4G networks are not hammered. 9. The team at Slido have worked hard and continue to do so to constantly improve the product. 10. Above all else the Slido team are a pleasure to do business with, values driven people who believe audiences should have a voice and events should be participative. For transparency I have not been made an ambassador for Slido but honestly if I were, I'd willingly take that role. Find out more at Slido. 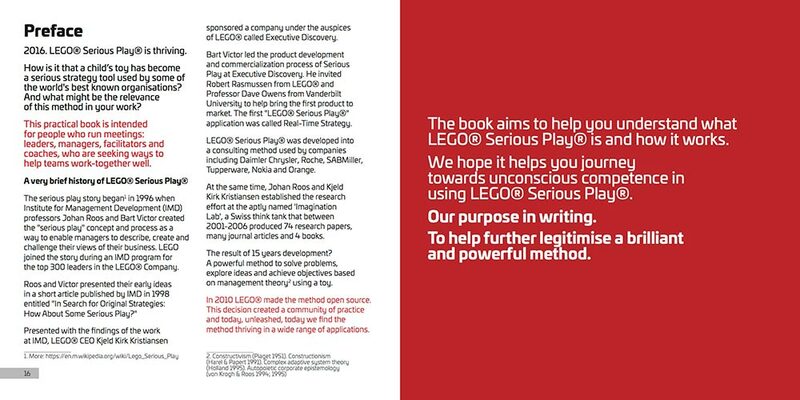 Here is the preface from the book published by ProMeet, "Serious Work: How To Facilitate Meetings & Workshops Using The Lego® Serious Play® Method"
What happens at a LEGO Serious Play MeetUp?